After the first T20 International between India and New Zealand, the home team won. The Kiwis won by 80 runs at the Westpac Stadium in Wellington, New Zealand. In the second T20I, India fought back and won by seven wickets leveling the series 1 – 1. New Zealand won the toss and opted to bat first at Eden Park in Auckland. India was chasing a run total of 159 runs. The team reached their goal in just 18.5 overs. The match ended with 162/3 in 18.5 overs for India, and 158/8 in 20 overs for New Zealand. India won by seven wickets when there were seven balls left. 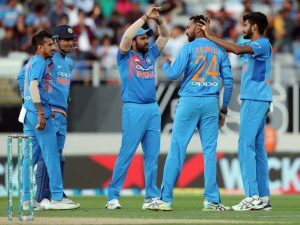 Whether India manages to win the series or not, a T20 win in New Zealand for the visitors is a significant accomplishment. Rohit Sharma, the T20I Indian skipper, noted that the team bowled well at the beginning of the match. He noted that the team was clinical when batting. Sharma felt that the team carried out their plans well this time. He did however feel that there is still plenty to learn from their mistakes. Sharma noted that the final game of the series is likely to be a challenging one. He explained that the challenge is exciting, and that his team look forward to a series win. Krunal Pandya took the Man of the Match award, for his bowling contribution. He noted that he dimensions of the cricket grounds were different to those in Wellington. This makes it important to adapt bowling to fit the different sized grounds. Next up is the final of the three-match series. The game will take place at Seddon Park in Hamilton later today. After the third ODI, the Indian team returns home.